Polyptychus trilineatus Moore, 1888, Proc. zool. Soc. Lond. 1888: 390. 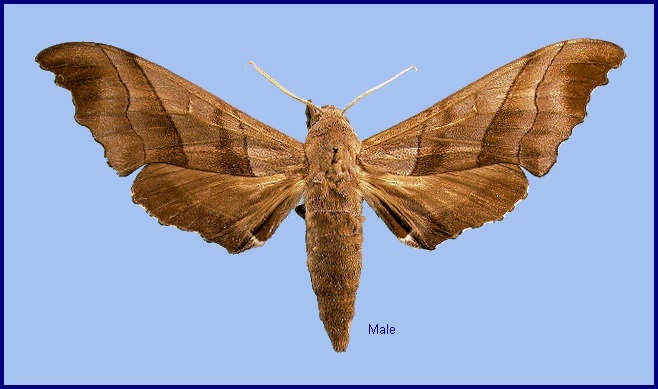 Type locality: [India, Himachal Pradesh,] Dharmsala. Synonym. Polyptychus trilineatus undatus Rothschild & Jordan, 1903. Wingspan: 74--112mm. 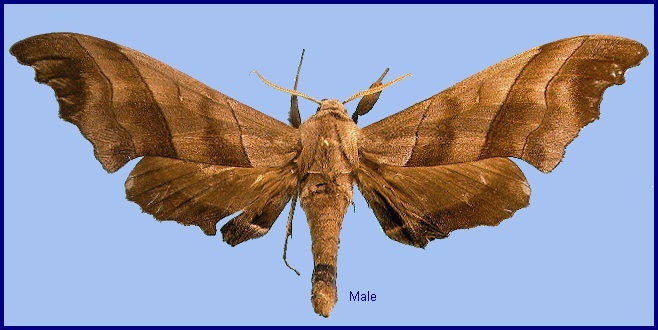 Very similar to Polyptychus chinensis chinensis and Polyptychus dentatus but distinguishable by the convex section to the submarginal line between forewing veins M2 and Cu2. 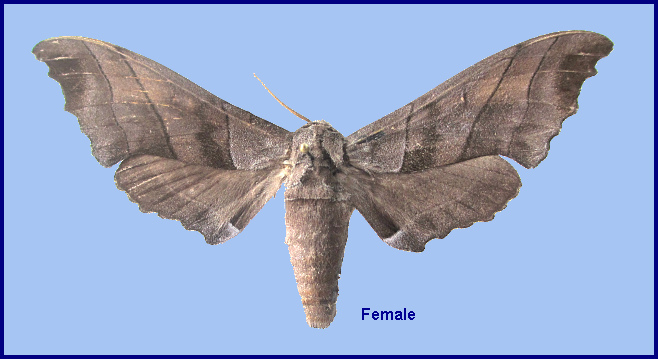 Forewing outer margin slightly to strongly crenulated. 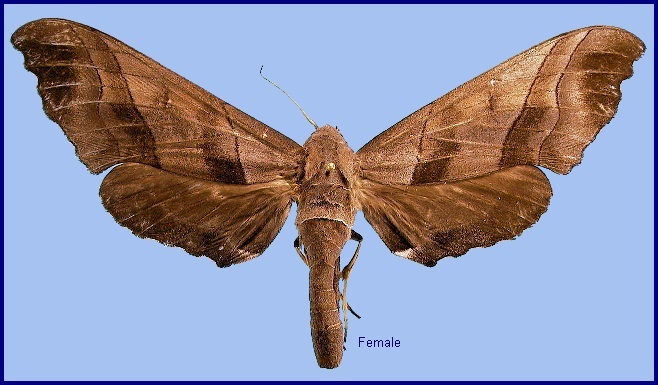 Forewing upperside ground colour varies from pale brown to purplish-grey. In the male genitalia, uncus narrowing to a long, strong, acute hook, apex pointed, not emarginate as in Polyptychus dentatus. Gnathos a small fold. Transtillae with a pair of long, posteriorly-directed, needle-like processes. Juxta with two ventral processes medially fused to form a single fishtail-shaped process; dorso-lateral processes very unequal, right process long and pointed, projecting beyond middle of valve, left process short and apically rounded. Valve divided apically by a longitudinal slit; dorsal lobe rather weak, apically dilated and incurved; irregularly spatulate; ventral lobe with two incurved apical teeth, set close together ventral tooth slightly longer than dorsal tooth. In the female genitalia, eighth tergite (A8) excavated, with a sharp prominent cone on the upper surface at each side directed posteriorly. Sterigma differs markedly in shape from Polyptychus dentatus, notably the lamella postvaginalis is much larger, distal margin slightly emarginate, medially somewhat produced and downcurved, so that it appears medially almost sinuate in posterior view, angles of lamella rounded. OVUM: Pale green when laid, and almost spherical (2.2mm) (Eitschberger & Nguyen, 2016e). LARVA: Full-fed 76--80mm. Very similar to that of Polyptychus dentatus (Bell & Scott, 1937). First instar larvae appear not to feed and wander around a lot looking for a suitable site to change into the second instar (Eitschberger & Nguyen, 2016e). PUPA: 28--30mm. Very similar to that of Polyptychus dentatus (Bell & Scott, 1937). Larval hostplants. Ehretia (Boraginaceae) (Inoue, Kennett & Kitching,  1997). On Ehretia laevis in India (Bell & Scott, 1937), and Ehretia acuminata in Thailand (Eitschberger & Ihle, 2014). China: Yunnan (Menglun County); Xizang/Tibet (Motuo, near Indian border); Hainan (Wanling). Northern Pakistan (Margalla Hills, Pir Sohawa, 1000m, 73°08'E, 33°49'N, 4.viii.1998, leg. Z. Varga & G. Ronkay) (Rafi et al., 2014), northern India (Subhasish Arandhara, 2016), Nepal, Bhutan, Burma/Myanmar, southern China (Xizang/Tibet, Hainan), Thailand and Vietnam.